In order to receive replication data from a tenant, at least one proxy is needed. This proxy needs to be able to talk with its controlling VBR server, the vCenter server (standalone or connected to vCloud Director) and all the ESXi hosts. To increase the availability of the service, deploy multiple proxy servers. Any service provider should consider carefully how many proxies are necessary based on the specific design of the environment. Proxies need to communicate with the different components: ESXi hosts and vCenter, Veeam Backup & Replication server, cloud gateways, WAN accelerators. For this reason, you should add firewall rules between the different networks. 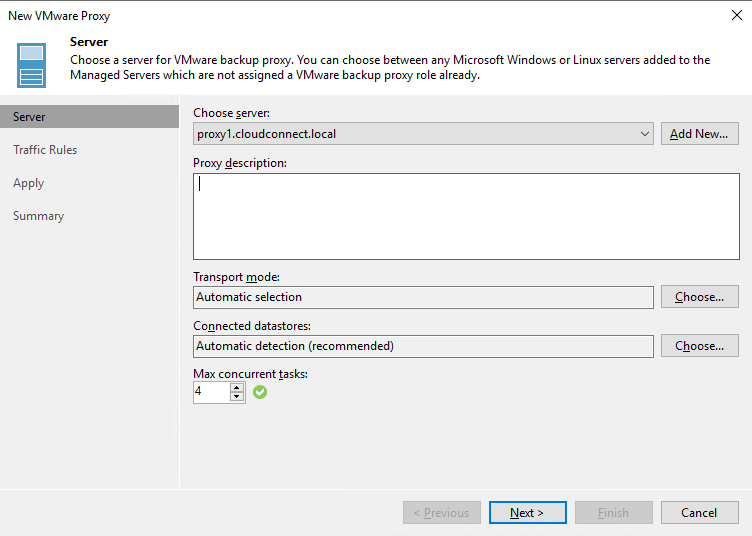 You can disable the last rule and enable it only when a new Veeam component needs to be installed or upgraded because Veeam uses SMB shares to deploy the installer packages into remote Windows servers. You should leave all the configuration parameters as the default ones; transport mode specifically should be left as automatic because the proxies are VMs and they will use hotadd mode, which is the preferred mode for a target proxy. However, leaving automatic selection on allows for the usage of network mode as a failover option should something not work for the hotadd mode. Traffic rules are also left empty, as any bandwidth management is done directly by Veeam Cloud Connect when configuring a tenant. One last step must be done once the different Veeam proxies have been deployed: By default, the Veeam Backup & Replication server itself is also configured as a proxy. To guarantee that replication traffic follows the designed path from cloud gateways to WAN accelerators and proxies, you have to disable the default proxy role installed in Veeam Backup & Replication server or even choose to remove the role completely.